Sporting terms are just one way of measuring the tensions and compromises of business success. Beware of consultants bearing theory. Should you read any book by management consultants, keep in mind that they might be trying to sell their latest blueprint. And in the case of The Three Tensions, it is about using a complex set of metrics, an activity that no doubt requires expert assistance. The book's premise is the need for companies to manage three pairs of potentially conflicting goals: profitability versus growth, short term versus long term, and management of the whole of the corporation versus its constituent parts. The thesis is that rather than having to compromise between, say, growth or profit, the company should do both. And to find out whether corporations are on the right track, The Three Tensions recommends using a special metric tool: the batting average. What it measures is the 'bond' between the tensions: customer benefit for growth and profitability, sustainable earnings for short and long-term perspectives, and diagonal assets (resources that help a company act as both a single company and many different businesses at the same time) for the whole and the sum of the parts. The term batting average will be familiar to baseball or cricket fans, but for those not au fait with sporting terms, it just means the proportion of years in which the company enjoys both profitability and sales growth. The tensions are well described in the book and all too familiar: big sales contracts being clinched at unattractive margins, investments in brand and product development cut due to 'trading conditions', and confusing swings between centralisation and decentralisation. We have all seen corporate mantras lurching between 'new sales' and 'tighten belts', especially with the advent of a new CEO. These organisational U-turns are always disruptive and often wasteful and short-sighted. But while the corporations' blunderings make good reading, they do not lead to any new insights. The real gap in the book is a lack of practical advice about how to deal with these tensions. The measures may be useful, but a drowning man has only an academic interest in how deep the water is. Three particular omissions are worth mentioning. First, no real attention is paid to what drives companies - namely, the markets that they operate in. It is fine to say that a company should grow sales and profits together, but how are they to do this if competitors bring out killer products, your industry is substituted by another or a technology breakthrough renders your products obsolete? The authors imply that had the right things been measured, these issues would not really be a problem. This is where the text will start to irritate managers who have battled with turbulent markets, new competitors and relentlessly changing new technologies. Second, CEOs are brought in on an agenda of change and usually for good reason. Of course they need to try to achieve both growth and profitability, but the organisational inertia they have to overcome means they need to alight on a few, well-chosen clear messages to achieve anything. Finally, too much time is spent on output measures rather than input effort. The analysis is fine for a management retrospective, but not helpful for leaders in the teeth of business adversity, who need to motivate their managers. The key points could have been more strongly backed by case examples on the practical use of the metrics and how they led to greater success. Instead, numerous quotes from CEOs acknowledge that tensions between objectives do exist in corporations. The shorter form of this book is a Harvard Business Review article and may be the best read for busy executives. Despite the analysis of 1,000 companies and the quantitative background of the authors, The Three Tensions is surprisingly soft and deals only with correlations at a fairly high level. Is this an indication that the analysis yielded few results? In addition, it is highly questionable as to whether the batting average metric is the "great overlooked measure of corporate success". Successful innovation is the way to achieve growth and profitability. Innovation is the link between today's products and what you can offer customers in the future. Innovation exploits the knowledge held in subsidiaries to benefit the whole corporation. This book is just about how to keep score. 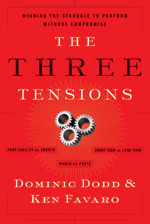 The Three Tensions: winning the struggle to perform without compromise, by Dominic Dodd and Ken Favaro, Pfeiffer Wiley, $27.95, ISBN: 0-78798-779-4. Christopher Tchen is a client director at consultancy Eden McCallum. David Hoare is chairman of Fairline Boats and an advisory board member at Eden McCallum.